LuxLight Foldable Double LED Softbox. This is the LuxLight double softbox kit with powerful 50w LED bulbs, it is an excellent portable lighting set aimed at both photography and video work. The two softboxes measure 50x50cm and open up like an umbrella for a quick and easy set-up. The stands are height adjustable up to a maximum of 1.9m with standard spigot for connecting the softbox attachments, it also features a 1/4 thread for another mounting option. The 50w LED light bulbs have the standard screw E27 fitting, they are energy efficient and provide a high quality of light with a CRI of 88 at the optimum white daylight temprature 5400k. They are also noise free and flicker free and are an excellent choice for lighting during a video shoot. The LED kit is a powerful, compact and portable continuous lighting kit that can be used for photography and is excellent for video. A padded carry bag is included with two carry handles and an optional shoulder strap, making it easy to travel with your full kit, which only weighs 5.2kg and can be carried with little stress. OPTIMUM LED OUTPUT: The 50w 5400k LED bulbs supplied are flicker free and silent and produce 4000lm each, which is significantly higher than other CFL and LED bulbs on the market. They also have an impressive Colour Rendering Index (CRI/Ra) of 88. The bulbs are an excellent choice for video work. TOP QUALITY SOFTBOX DESIGN: The 50cm Softboxes have an easy assembly design making them stress free and convenient for on-location shooting and popup studios. The softboxes have been carefully made using high quality materials, both the reflective material and diffuser are made with a butterfly cloth which has been designed to give as neutral colour cast as possible. CARRY BAG: A well made & durable carry bag is also supplied to keep your kit snug and safe in transit or storage. The bag is filled with absorbent polystyrene blocks and a protective foam panel on the bottom to protect your equipment from damage. It has two standard carry handles but also includes an optional shoulder strap. We are a fully VAT registered U. K based business unlike most other sellers on Amazon. Easy set-up pop-up umbrella softboxes with build in bulb holde. 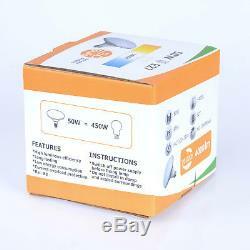 50w Highly Efficient LED 5400k Daylight Energy Saving Bulbs CRI > 88. 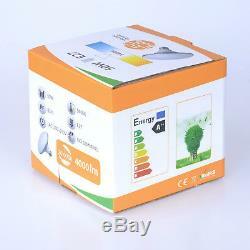 50 x 50cm Softboxes for soft or average light. Lightweight fully adjustable stands from 0.7- 1.9m. Gross Weight: Approx 5.2kg. 2 x E27 50w 5400k, 93-95 CRI LED Light bulbs. 2 x 1.9m Tripod Lighting Stands. 1 x Padded Carry Bag. H- 11cm W- 14cm L- 14cm. Very welcome if you live in the local area (Newcastle Upon Tyne, NE15 6UG), will give. Might also be able to deliver ourselves if the location and time are suitable, please get in touch. Cheques, Postal Orders & Bank Transfers. Please allow 3-5 days for cheques to clear before we dispatch your item. Pay before 2pm Monday Friday. All of our items are boxed and packed to a high standard to make sure your items reach you in good condition. The above is only relevant for UK mainland. These areas will require a surcharge. Please don't hesitate to get in touch with any queries, general advice regarding photography & lighting, or any advice regarding product photography equipment & techniques. The item "Portable Photography Studio LED Softbox Lighting Kit LuxLight Foldable Video" is in sale since Wednesday, September 12, 2018. 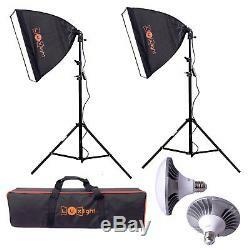 This item is in the category "Cameras & Photography\Lighting & Studio\Continuous Lighting\Lighting Kits". The seller is "photogeeks11" and is located in Newcastle upon Tyne. This item can be shipped to all countries in Europe.